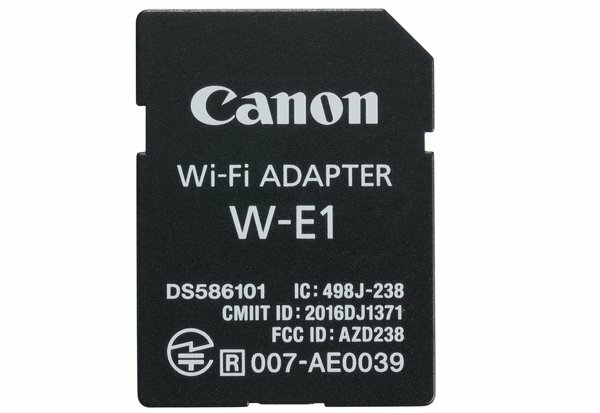 The Canon W-E1 Wi-Fi Adapter is a wireless add-on card for select Canon DSLRs. World Without Wires. The Canon W-E1 adds the ability to wirelessly transfer pictures and videos from a Canon DSLRusing the 2.4GHz band at a distance of up to 32.8 ft.
SD Card Form Factor. The W-E1 plugs directly into the camera’s SD card slot, which means there’s nothing hanging off the exterior of the camera. This means you won’t be able to record images using the SD card slot, so be sure you have CompactFlash memory cards. Please Note: The W-E1 Adapter only works with 7D Mark II, 5DS, and 5DSR with Firmware Version 1.1.0 or later installed. Video transfer is available for the 7D Mark II using .MP4 videos.